Well readers, there goes February! And what an unusually romantic month it was, with Valentine gifts arriving for the Lovestruck and Grumpy Mascots, and a kawaiified chocolate arriving for us all to enjoy! And let’s not forget the fantastic designers, crafters, and shops we met along the way, including Japu, ShouShou Shop, and Candy Tree Lane to name a few. And, as ever, there was also our monthly puzzle! 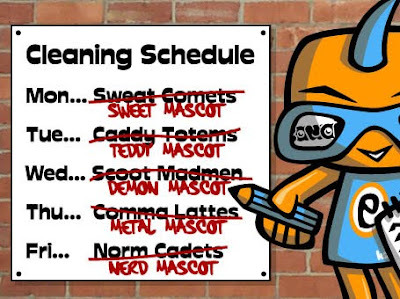 Did you unscramble the mascot anagrams on the cleaning schedule? It was: Mon… Sweet Mascot, Tue… Teddy Mascot, Wed… Demon Mascot, Thu… Metal Mascot, and Fri… Nerd Mascot. Amazing! Although who’d of thought the Sweet Mascot was an anagram of Sweat Comets? I can’t imagine she’ll like that much! Oh well, that’s all for this month, folks, but be sure to come back next month when we’ll have plenty more kawaii treats for you all to enjoy! So long!